For many years, through most of the 1970's to 1990's, most Australians were by law, denied the right to legally own, or even have any contact with reptiles. This meant that keeping reptiles as pets was banned. Those who transgressed had their reptiles seized by authorities and they were jailed. It was that simple! 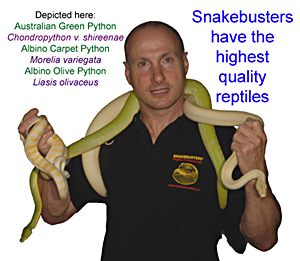 As a result of a one-man campaign by Snakeman Raymond Hoser to change the laws, culminating in the publication of the best-selling books Smuggled in 1993 and then Smuggled-2 in 1996, governments Australia-wide were finally forced to rewrite laws to allow for the private ownership of reptiles and also allow private people to do wildlife shows, school incursions and even children's parties as now seen with companies like Snakebusters and others. The Bible on the subject of finding, keeping and breeding Australian Reptiles was the best-seller Australian Reptiles and Frogs by Raymond Hoser that was published in 1989 and has long been out of print. Copies turn up occasionally at places like "E-bay" and sell for about $500 a book (2008 average). Raymond Hoser is currently preparing a new and expanded book on the subject and this will hopefully go on sale at end 2011. Following are brief notes on reptiles as pets and the steps required. You are also recommended to obtain a copy of "The Hoser Wildlife Collection" CD-rom which has the full page proofs from the definitive book "Australian Reptiles and Frogs" and over 150 very useful articles and papers on reptiles by Raymond Hoser and other recognised experts (published on the CD-rom with their permission). 1/ Obtain a license or permit from your state wildlife authority. They are in the white pages under government, or more simply click here. Do not build a cage or obtain a reptile until you have the licence to hold one. As a result of publication of the "Smuggled" books in the 1990's, governments across Australia re-wrote wildlife laws to make private ownership of reptiles legal. So while nowadays licences are given to most people, there are times when these are not issued and so a permit should never be anticipated. Wait until you have the paper in your hand. These typically take a month or two to issue after you have paid your application fee and properly filled in the paperwork. 2/ Get proper housing for the reptile/s you intend to keep. Also ensure that things like food supply are also taken care of. Beware: there is plenty of information available, including on the internet, but much is unreliable, wrong or misleading. The information on the "Hoser Wildlife Collection" CD-rom is accurate, as is the material on the website http://www.herp.net (although a lot of the latter is technical and not terribly useful to a novice keeper). 3/ Obtain your pet reptile. Pet shops are the usual point of purchase for most people, but private breeders usually offer the same for about half the cost. Do not buy sick or unhealthy reptiles or any with signs of parasite infestation. Notwithstanding the occasional benefits of buying online (price), or interstate (Price or species), it is generally recommended that you see the reptile you intend to buy, before making a purchase. If living in a large city, you should be able to find what you want in that city and without the need to shop elsewhere. 1/ It will cost nearly $1000 Australian to set up and buy your first reptile (ball-park figure). Later additions to your collection in terms of caging and purchase will not cost this much. 2/ You will usually need to feed live food to your reptile at some stage. 3/ You must be completely able to handle the reptile in all situations as this may be necessary at times of illness. 4/ By getting a reptile licence (legally required) you will be liable to have raids and inspections on your property by the relevant wildlife officials. While most wildlife officials will do their job honestly and with integrity, there are exceptions (see the books Smuggled and Smuggled-2 for examples). You have been warned. 5/ Beware of false, misleading and reckless information on reptiles peddled on the internet, including many online "forums". We have lost count of the number of cases whereby people have taken advice from alleged "experts" online, sometimes being people with little or no meaningful experience with reptiles, (in spite of baseless claims of many years experience), with the end result being one or more dead reptiles as a result of this wrong advice being taken. While it is possible to warn against names like David Williams, John Weigel, Shane Hunter and Wolfgang Wuster, things are made more difficult by the fact that these people and others of dubious credibility have a habit of cross-posting under multiple identities to add credibility to their often distorted and dangerous viewpoints. This makes verification of a huge amount of internet-based information very difficult. Again, you have been warned!